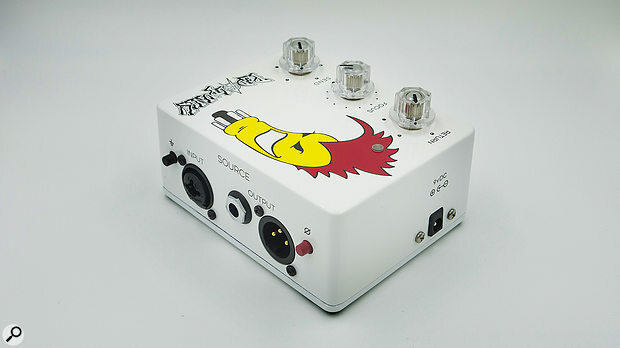 Pedalpunk (which doubles up as the company and product name) offers a well thought-out means of incorporating your unbalanced guitar pedals directly into a recording system, where balanced line-level signals are the norm. This active box, powered by an included 9V PSU, has quarter-inch send and return jacks that connect to your pedal (or chain of pedals) and balanced XLR input and output connectors to hook up to your audio interface or other professional audio gear. The output is also available on a balanced TRS jack, which will make hooking up to different systems a little more convenient. The circuitry includes an audio transformer, and the manufacturers invite your to experiment with overdriving the Pedalpunk to add some transformer saturation for effect. It’s more than a simple interface, though — you also have a few controls to play with. There are send and return level adjustments, to get the right levels going to and from your pedals. There’s no metering, but since not all pedals accept the same input signal level before running out of headroom, so there’d be little point; this must be set by ear. A third knob, Focus, adjusts the impedance ‘seen’ by the connected pedal — some pedals can be quite fussy on that score, or give you different sounds when presented with different impedances. Essentially, you just need to experiment with this to get the desired sound. The only other controls, which are buttons found on the side of the case, are for the ground-lift and polarity-invert functions. If you’re just planning to use a pedal to record with, you can simply plug your instrument into the pedal, plug the output of the pedal into the line input of your interface and you’re good to go. However, the Pedalpunk scores higher where you want either to insert a pedal into a mixing console or balanced signal chain, or to hook it up to your audio interface for use as an ‘external effect’ in your DAW. The price might deter some home users, but in a professional or serious home studio, where a ‘hygienic’ way to integrate pedals into a DAW’s signal flow is very desirable, the Pedalpunk makes a lot of sense. It provides optimal impedance and level matching for pedals, which should result in the lowest possible noise and best use of pedal headroom. It won’t make a noisy pedal quiet, of course, but it will give you the best possible performance from any connected pedal, and that’s about as much as you can ask for. For my tests, I connected the Pedalpunk directly to the ins and outs of a PreSonus Studio 192 audio interface and tried a number of pedals with it, including an EHX compressor and a few overdrive pedals, which are often particularly sensitive to levels and impedances. It does exactly what it claims, without noise or fuss — I never really noticed any significant coloration unless I deliberately drove the levels to achieve a little subtle transformer warmth. Similarly the Focus control only makes a very subtle difference to the high end with most pedals, but it’s good to have it, particularly if you’re trying to get the same tone from your pedal as when you play directly through it. All in all, the Pedalpunk is a solid piece of kit and a good solution for those who want to make regular use of their pedal collection with a console, or to inject a little life and soul into their DAW mixes.